(Orange flesh) 85 days [1935, Aaron Pike of Pike & Young Seeds; seedstock supplied by Aaron Pike’s niece.] Outstanding flavor; a local favorite, for many this is the only muskmelon they’ll grow. Bred specially for growing in unirrigated clay soil. 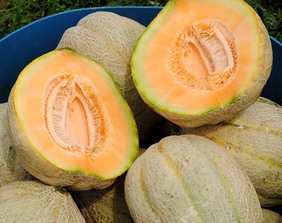 Produces 3 lb fruits on unirrigated clay, 7 lb fruits on good irrigated soil. Heavily netted, oblong fruits. Vigorous, high-yielding, disease-resistant plants.